ROMA d'Alfonso Cuarón, Lion d'Or au dernier Festival de Venise! Roma is a Protected content film written and directed by Alfonso Cuarón, who also produced, co-edited and shot the film. A co-production of Mexico and the United States, it stars Yalitza Aparicio and Marina de Tavira. Set in Protected content 1971, the film is a semi-autobiographical take on Cuarón's upbringing in Mexico City, and follows the life of a live-in housekeeper to a middle-class family. The title refers to Colonia Roma, a neighborhood in the city. 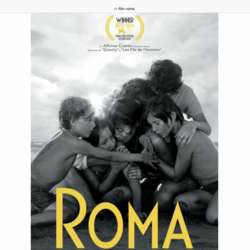 Roma had its world premiere at the 75th Venice International Film Festival on 30 August Protected content , where it won the Golden Lion. It began a limited theatrical run on 21 November Protected content . The film received universal acclaim for Cuarón's screenplay, direction and cinematography, as well as Aparicio and de Tavira’s performances. Roma received several accolades, including two Golden Globes for Best Director and Best Foreign Language Film at the 76th Golden Globe Awards, and four Critics' Choice Awards, including Best Director and Best Picture at the 24th Critics' Choice Awards. It received seven nominations at the 72nd British Academy Film Awards, including Best Film, Best Director, and Best Film Not in the English Language. It was also selected as the Mexican entry for the Best Foreign Language Film at the 91st Academy Awards, making the December shortlist. Let us see together this « chef d’œuvre cinématographique ». We’ll have a drink and discussion afterwards.